Prince Turki Bin Abdullah Bin Abdulaziz Al Saud, the Governor of Riyadh Province in the presence of Dr. Mohammed Bin Hamza Khoshaim, Vice Minister of Health for Planning and Development, Ministry of Health; Dr. Jean-Marie Le Guen, French Minister of State for Relations with the Parliament; Bertrand Besancenot, Ambassador of France; IP dignitaries, international delegates and industry professionals during the inauguraion. 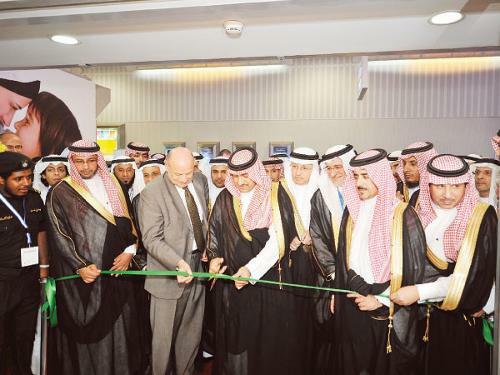 The second Saudi Health Exhibition & Conference, which got under way at the Riyadh International Convention & Exhibition Center (RICEC), was officially inaugurated Monday by Prince Turki Bin Abdullah Bin Abdulaziz Al Saud, the Governor of Riyadh Province in the presence of Dr. Mohammed Bin Hamza Khoshaim, Vice Minister of Health for Planning and Development, Ministry of Health; Dr. Jean-Marie Le Guen, French Minister of State for Relations with the Parliament; Bertrand Besancenot, Ambassador of France; IP dignitaries, international delegates and industry professionals. Running until Wednesday, Saudi Health the largest healthcare event in the Kingdom and hosts more than 300 exhibitors from 35 countries and 10,000 industry professionals to highlight the development path and prospects of the Saudi healthcare sector. The products and services being showcased at Saudi Health 2014 emphasize the heightened importance of the healthcare sector for the kingdom. In collaboration with UBI France, the Orange Business Services team showcased ICT and healthcare solutions now available in Saudi Arabia. “ICT and healthcare investments are converging to create connected-health opportunities in Saudi Arabia, where ICT investments are set to transform healthcare and improve the lives of citizens and residents here,” said Laurent Marini, Country Manager of Saudi Arabia for Orange Business Services and Managing Director of Orange Business Arabia. In addition, the Saudi Health saw the unveiling of two new ‘word first’ infection control products by GV Health. GV Health spill kits and packs are used throughout the Middle East by organizations such as the Saudi Ministry of Health, Saudi National Guard and Libyan Ministry of Health. Furthermore, Aramex launched Biocare, a brand new cold supply chain service across Aramex MENA markets, at Saudi Health 2014 as an innovative solution for the healthcare sector, providing an end to end temperature controlled delivery solution suitable for laboratories, hospitals and pharmaceutical companies, to move clinical specimens and medical samples domestically and globally. In addition to the exhibition, the Kingdom’s premier healthcare event hosts 10 conferences accredited by the Saudi Commission for Health Specialties (SCFHS). The conferences discuss important and currently relevant topics related to the local and regional healthcare sector including nursing, hospital management, medical laboratories, biomedical engineering, cardiology, radiology technical management, nuclear medicine, rehabilitation, future of healthcare sector in Saudi Arabia and the future of radiology in Saudi Arabia. Fueled by a significant 30 percent growth compared to the last edition, Saudi Health 2014 secured the participation of eleven major healthcare organizations as sponsors of the event including Rakaa Medical Company as the diamond sponsor and Siemens Saudi Arabia, Salehiya Medical, Dräger Saudi Arabia, Nawah Healthcare, Care and Planning for Hospital Co. Ltd., Mediserv-Medical Supplies and Services Co, GE Healthcare and Saudi German Hospitals as platinum sponsors, in addition to 3M and Gulf Medical Company as gold sponsors.